Thomas the Tank Engine are adding 14 new characters to the sleepy railway of Sodor to diversify the cast. Mattel have unveiled a fantastic array of offensively politically correct trains representing cultures around the globe. My personal favourites are Ashima and Rajiv from India; although I think Mattel missed a trick by not adding the hundreds of Indians who hang off the trains? Here’s a more accurate depiction of Rajiv by yours truly. The new characters will make their debut in the new film, The Great Race, which will be released in the UK in May 2016. The Great Race sounds a bit Nazi if you ask me? I sincerely hope they bring Ringo Starr back as narrator and let him showcase his best Maharishi accent for the voice of Rajiv. 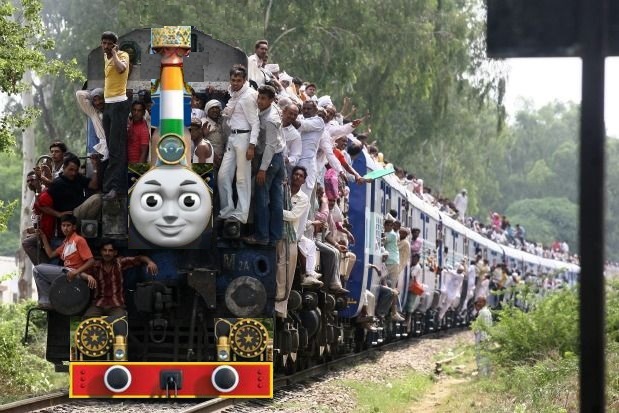 This entry was posted in Films and television and tagged Ashima, diverse, diversity, engine, great race, Indian, Indian trains, multicultural, overcrowding, political correctness, Rajiv, Ringo Starr, tank, Thomas on April 7, 2016 by Kevin.